The earliest formation of fire unions in the United States came at the turn of the century. Prior to this time, members of the fire departments were wholly dependant to the good will of the municipal officials for salaries, working conditions, and other benefits. They were considered unskilled labor and made $2.50 a day in wages. The continuous duty system in the early years allowed firefighters to leave the station only three times per day to obtain meals. They may have received one day per month off. The concept of pensions, insurance and other basic benefits was unheard of. Prior to the formation of the union, there was no job security. Every two years when a new mayor was elected, they would usually install new fire and police chiefs, who would in turn hire his friends for each department. It was not uncommon for a fireman to work 2 years on the department, not work for the following 2 years on the department, then be re-hired on for two more years. Promotions were made almost wholly upon the political pull of a firefighter and the political winds blowing at the time. That is why the Pueblo Fire Dept. had nine fire chiefs from 1889 until 1911. That is also why the firemen decided to unionize, to stablize the positions on the department. The Pueblo Fire Dept. was the third fire department in the country to unionize, and organized as the City Firemen's Union No. 14339 on October 12, 1912. They were affiliated with the American Federation of Labor, the Colorado State Federation of Labor, the Pueblo Trades & Labor Assembly, and the Colorado State Firemen's Association. Changes were made swiftly, starting with a new work schedule. The department went to two 12 hour shifts, 7 days a week, making for an 84 hour work week. They were also the main force behind the creation of the Civil Service Commission in 1914, which stablized both the chief's position, and that of the firemen. Also, promotions were based not on political clout, but a variety of factors, including seniority, testing, and the capabilities of the firemen. The chief at that time served as long as the first 8 chiefs of the PFD (Chief Sam Christy from 1911 until 1931). 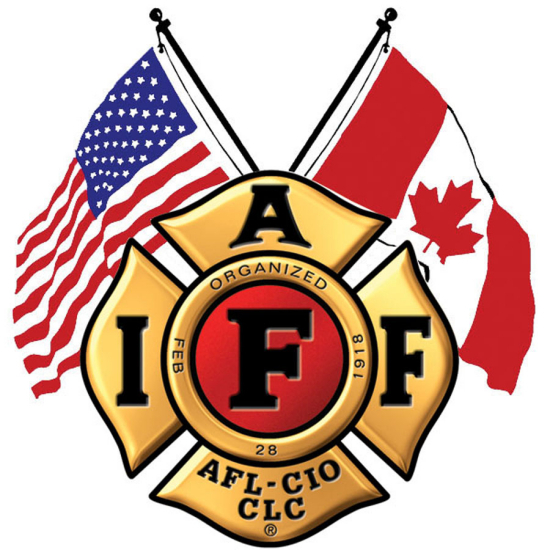 On February 28, 1918, 36 delegates from 24 fire departments met in Pittsburgh, Pennsylvania to create the International Association of Fire Fighters. Pueblo, being the 3rd unionized department in the country, was a founding member (as was Colorado Springs, Local No. 5) and given the designation of Local 3. Wages, a pension, death benefits for surviving spouses, and better working conditions were some of the issues that the IAFF has fought for over the years. 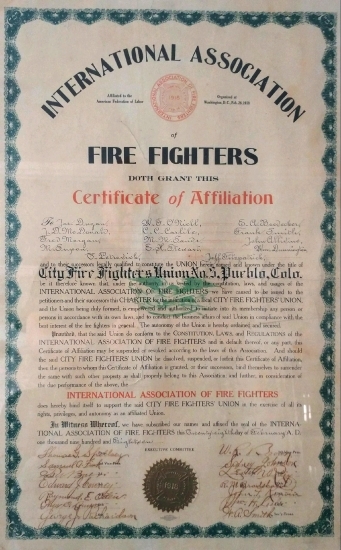 Pueblo Firefighters original charter with the IAFF. Pueblo's original charter document has been through its share of catastrophies. It survived the devastating 1921 flood in Pueblo. The union hall was in the old city hall at 125 Central Main St. on the second floor (this also housed several fire department companies and the fire chief's office). The flood waters measured 12 feet at the old city hall, washing the Gamewell Fire Alarm base station several miles downstream and damaging the first floor quite extensively. Then in 1953, the fire union was meeting at the United Steelworkers suite in the Central Block Building, at the corner of 1st and Main Streets. 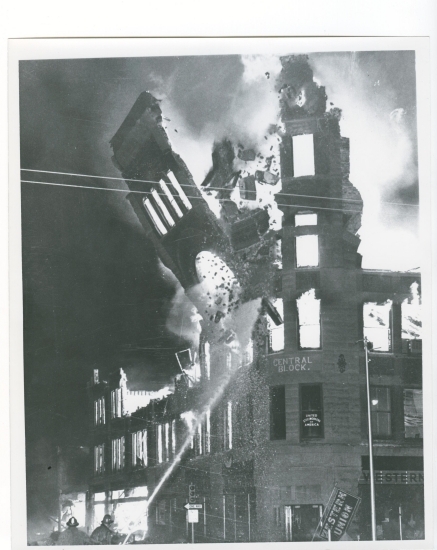 Both the firefighters and the steelworkers original charters were hanging in the suite, when on August 29, 1953, fire broke out in the Central Block Building. You can see in the corner on the second floor, a three line sign on the window. It says "United Steelworkers of America". This was where the charters were hung. Firefighters were able to retrieve the charters before the fire reached the suite. So the Pueblo IAFF Local 3 charter survived both fire and flood, and we now keep the charter in the union safe. Pueblo firefighters now work a 56 hour week, have vacation and sick days, and many other benefits, thanks to the union. 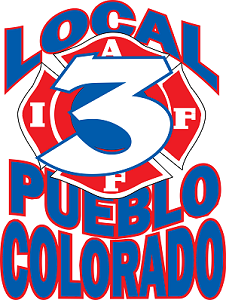 With nearly 5,000 locals now in existence and over 250,000 firefighters being represented by the IAFF, Pueblo is very proud to be Local No. 3.